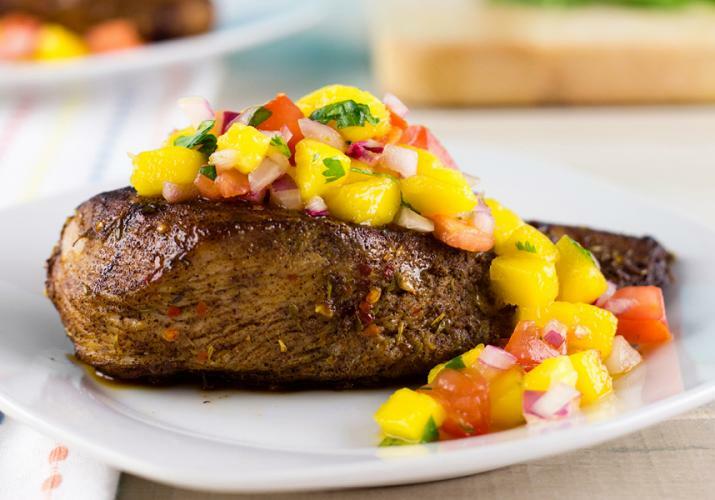 The mango salsa in this dish really adds a Caribbean flair. I love to serve this meal when having guests over for an outdoor party. It presents like it would take hours to prepare, but really takes around 30 minutes! 1. To make the salsa: In a medium bowl, stir together the mango, tomato, onion, cilantro, lime zest, lime juice, and salt to combine. Refrigerate until ready to serve. 2. To make the jerk chicken: Place the chicken breasts and jerk seasoning in a large resealable bag. Seal and shake a few times to evenly coat the chicken. 3. In a large skillet, heat the olive oil over medium heat. Add the chicken and cook until done, 4 to 6 minutes per side. 4. Serve the chicken warm topped with the mango salsa. Feel free to purchase frozen mango for this recipe. To thaw the mango, place 1 cup frozen mango in a bowl and refrigerate for at least 5 hours before ready to use. Try to stir or turn the fruit a few times while in the refrigerator for an even thaw and drain any juice or water from the mango before using. TOPS is proud to welcome Skinny Mom, Brooke Griffin! Griffin is originally from Corbin, Kentucky and strives to educate, motivate, and inspire other moms to live their healthiest life.